At Blackjack Horticulture, we know the grass is greener for a reason. Therefore, the daily details matter as much as the big picture, and nothing matters more than relationships. Simply put, we’re passionate about what we do. We always have been. Whether we’re bringing a landscape architect’s vision to life, managing lawns and gardens or engineering masonry projects, we measure success by our clients’ satisfaction. If there’s anything we’ve learned since Blackjack opened its doors in 1998, it’s this: the right way is the only way to deliver the long-term value you deserve. Our approach to business is built on earning your trust, keeping our promises and placing your needs first. So if you’re looking for more from your landscape company, call us — and together, let’s think outside. In 1998, Blackjack Gardens, Inc. began by a local Birmingham family. Located along the Blackjack Ridge in northeast Jefferson County, the name was taken from the Blackjack Oak trees populating this mountain ridge. The company originally incorporated many divisions, but in 2004, the horticulture group separated to become its own enterprise. Blackjack Horticulture, Inc. is now independently owned by Bryan Word who has worked with the business since its early years. Andrew started with Blackjack in 2006. He began with the installation team before transitioning into maintenance account management several years later. His time in these positions provided an impressive breadth of experience that now informs his role as Vice-President of Landscape Operations. In this capacity, Andrew supervises not only our installation and maintenance crews, but the floriculture division as well. His role requires the ability to never lose sight of the “big picture,” but he supplements that with a keen attention to detail that allows him to always identify a plant out of place. Andrew’s intuitive nature and industry expertise make him the go-to person for all questions. He grew up in Sylacauga and graduated from Auburn University with a B.S. in Landscape Horticulture. 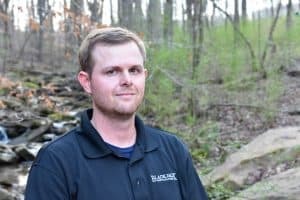 Once hunting season starts, you can likely find Andrew deer hunting in Coosa County or spending time with his wife and six-year-old daughter. 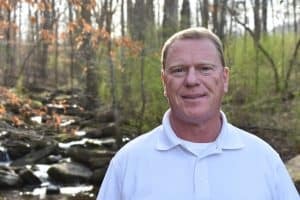 After working with Gibb’s Landscape in Atlanta, John decided to relocate closer to his roots. He dedicated three and a half years to their maintenance division, but recently joined the Blackjack team when he accepted a position as our Installation Operations Manager. John grew up in Florence before receiving two degrees in Landscape Horticulture and Turfgrass Management from Auburn. Since arriving at Blackjack, John has fully embraced the fast-paced and detail-oriented side of landscape. He’s bright, thorough and hard working – a great combination for managing the overall operations and project budgets within installation. On a personal note, John’s favorite plant is the Live Oak tree. Although the correct answer would have been the Blackjack Oak, he’s still in training. Austin started with Blackjack in 2016 bringing 10 years of experience in the horticulture field. He, like many of our exceptional team members, graduated from Auburn University with a degree in Agriscience. Since the beginning, Austin’s upbeat attitude and respectful demeanor have served him well in fulfilling his responsibilities as a Maintenance Account Manager. This task requires diligent oversight of crews and properties – which he genuinely enjoys (and excels in) as it allows him to also work hard alongside his guys in the field. Landscape maintenance may be his daytime job, but he is committed to his wife, two kids and vegetable garden in his free time. Taylor joined the Blackjack team with a degree in Landscape Design from Auburn and an acute eye for creativity. After teaching high school agriculture upon graduation, she assumed her current role as Floriculture Division Manager who designs, installs and manages every flower-related account. This is no small task, considering it often requires consecutive days of planting, watering and making sure our landscapes look up to par – even in the dead of winter. Taylor’s passion for all things floral compliments her love for people and keeps her clients happy. Although she appreciates all blossoms, her favorites are gardenias and pentas. When Taylor is not in the flowerbed, it’s a safe bet she’s with family – her nieces, nephews, husband or chocolate lab. Hailing from Bucksville, Alabama, Robert is our revered and time-tested mason. He brings 40 years of experience to the Blackjack team which means he can build just about anything as the Hardscape Division Manager. In addition, he is responsible for teaching and training the men following in his footsteps. If you were to ask Robert what he most enjoys about his role, he will likely say “everything.” He loves the challenge, creation and hard work necessary to bring something to life by hand. Leaving a mark – both physically and personally on people – motivates him, and we’re grateful for it. If you’ve worked here long enough to try one of his homemade biscuits, he is sure to leave a mark that way too. Cooking is a favorite pastime of his outside of being with his wife and two grown daughters. As our Installation Field Manager, Jonathan supervises the multi-faceted and high-paced world of bringing new projects to life. This includes everything from adding pine straw to installing over 4,000 plants at a botanical garden. As you can imagine, the time frame for these projects vary as well and he is adept at adjusting his schedule to allow for weather or external challenges. This is where his degree in Business Management from the University of Alabama at Birmingham and versatile personality come in handy. As one would expect, his role keeps him on his toes – but so does his baby boy whom he adores. 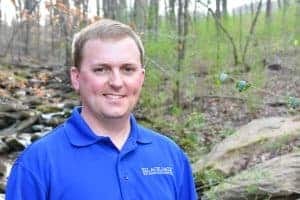 Jonathan and his wife have lived in Birmingham for 12 years and when he’s not at the shop, you will probably find him at the grocery store or in the kitchen savoring a freshly cooked meal. Betsy serves as Blackjack’s Vice-President of Business Development – a noble accomplishment given the many different hats required in this role. Also a graduate of the prestigious horticulture department at Auburn University, Betsy’s position with the company has evolved from single-handedly managing flowers to now overseeing all of estimating, sales and communications. Her strong relational skills, ability to strategically plan and competitive nature have been an enormous asset over the past 12 years. She thrives off day-to-day diversity, witty storytelling and will be the first to pull a practical joke if you’re not careful. Betsy and her husband enjoy spending time with their two-year-old son outside of work. If she’s not sounding out words or chasing him around the house, you will probably find her baking or tending to her private vegetable garden. Prior to joining Blackjack in January, Kellee dedicated 6 years as an Extension Agent throughout Alabama, Mississippi and Louisiana. 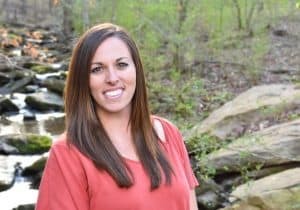 Her academic endeavors led her to attend Auburn for a bachelor’s in Agricultural Communications followed by a master’s in Agricultural and Extension Education from Mississippi State. She is a native of Cullomburg, Alabama, but has lived in Birmingham for a year and a half. Kellee’s role as Estimator oversees the competitive shopping of plants and landscape materials necessary for bidding potential projects. She tackles every project with a fearless ambition and strong reliability. When she’s not at the shop, you can find Kellee spending time with her husband, Matt, and their three furry children: Hank, Lilly and Daisy. 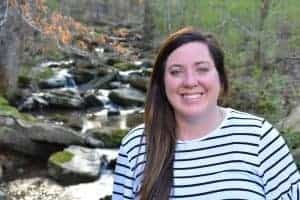 An emerging horticulture aficionado, Allie came to Blackjack five months ago after graduating from Samford University in 2016. Her degree is in journalism and mass communication with dual concentrations in public relations and advertising. Allie is well suited as Director of Communications overseeing three primary components: marketing and public relations, client relations and employee relations. At the core of her role is a passion for engaging people through artistic design and a well-crafted story. Her love for horticulture (and Auburn) has bloomed since being immersed in the industry, and she is especially fond of the Saucer Magnolia tree. In her spare time, she enjoys dancing, sipping a cup of tea and all things British. Bryan is the president of Blackjack Horticulture. He graduated from Auburn University with a B.S. in Landscape Horticulture and previously served as the president of the Alabama Nursery and Landscape Association. Not only does he hold 18 years of experience in the industry, Bryan is also the visionary, forward-thinking and driving engine behind the company’s growth. He enjoys the diversity of each day and excels in empowering young leaders to work hard with honesty and sincerity. As one of Blackjack’s two founding owners in 2004, he’s been around since the beginning – and we never let him forget it. In fact, we find it only appropriate that his favorite tree is an old oak. Bryan is married with three children whom he adores spending time with at home, at church or at the lake.